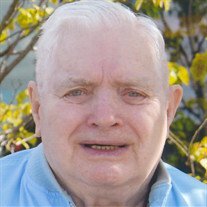 James R. Sheady, age 96 of Faribault, MN, passed away September 7, 2018 at his home. Memorial services will be held on Tuesday, September 11, 2018, at 10:30 a.m. at the Parker Kohl Funeral Home, 1725 Lyndale Ave. N., Faribault, with the Rev. Henry Doyle officiating. Following services a reception will be held in the Parker Kohl Community Room. Inurnment will be at the Cathedral of Our Merciful Saviour Columbarium. Memorial visitation will be held on Tuesday from 9:30 - 10:30 a.m. at the funeral home. James R. Sheady, was born on September 21, 1921 in Minneapolis, MN to James and Marvel (Freeman) Sheady. Jim attended Immaculate Conception Elementary School and was a member of the first class of boys to attend Bethlehem Academy High School graduating with the class of 1939. Following high school Jim attended the University of St. Thomas until he was called to serve in the U.S. Army during World War II. On Dec. 11, 1947 Jim was united in marriage to his special love Marjorie Zabel at the Immaculate Conception Catholic Church in Faribault. Marjorie preceded him in death on Feb. 23, 2006. Jim worked for many years at the Faribault Woolen Mill and at other businesses in Faribault. Together they worked a hard life but in retirement they were able to travel and enjoy life to the fullest. Jim belonged to both the American Legion and V.F.W. Last Man's Club. He looked forward each year to attending their annual meetings. He also looked forward to visits from family and friends. A kind and gentle man who will be sadly missed by all. Jim is survived by two sons, Mike Sheady and Dan Sheady (Susan Meyers), both of Faribault, MN; by three grandchildren, Amanda (Nick) Greenig of St. Peter, MN, Jim Sheady of Faribault, MN and Katherine (Wes) Brown of Fairmont, MN; by four great grandchildren, Adeline, Joe, Dylan and Destin; by his sister-in-law, Helen Stearns of Faribault, MN and by a special family friend, Patti Gartner of Faribault, MN and by nieces, nephews and other relatives and friends. He was preceded in death by his parents, wife and his sister June Cummiskey.